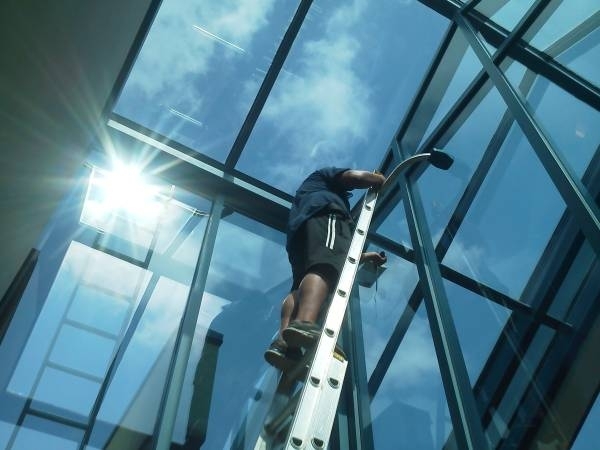 When I first started into the window cleaning business I had some decisions to make on the direction of my business and the level of service to offer. My biggest decision was do we offer an cheaper "economy" service where we are in and out of the house quickly offering a lower price but a lower quality job? Or do we offer a very extensive clean that would mimic what I would prefer to be done on my own home? Our decision? To offer a combination of both, a very extensive clean but at a very price competitive with others doing a much less extensive clean. 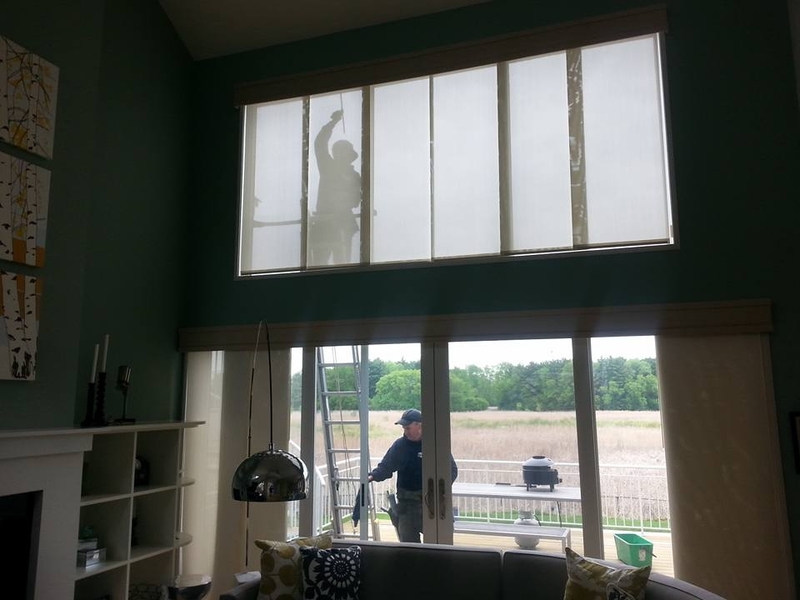 As you will see our 9 step process is very extensive leaving you with a very clean window/screen, we are much more than a typical window washer that just wets and squeegees your window. We will either dry scrub, wet mop, or pressure wash your screens depending on what is needed to give us our desired result. The screens are then set aside awaiting reinstallation at the end of the process. First, we will wet the entire window using a soft washer and our own mixture of window washing solution. The solution we use will leave your windows not only clean, but will protect the glass until your next cleaning. 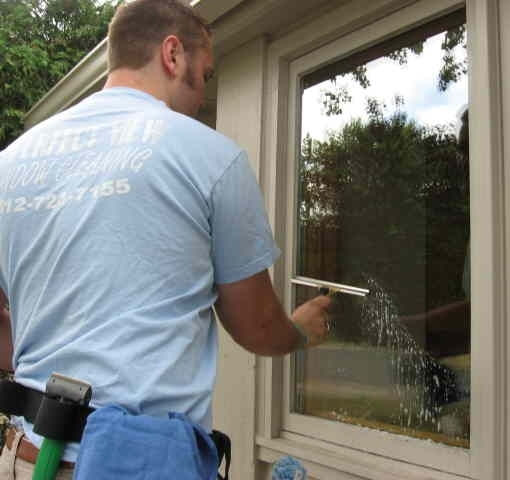 After wetting window we will clean your window of things like bugs, tree sap, paint overspray, etc. very carefully with a razor scraper, or use a safe aggressive. This process is very important to get a sparkling window and one that many inferior services do not offer. After your window has been cleaned with the scraper or scrubber, it is time to wet it again. Once the window has been scrubbed with the washer again it is time to wipe the edges with a 100% cotton towel so it is ready to squeegee. Now it is time to squeegee the window, we do this starting from the top of the window and working towards the base. Once the window has been cleaned with a squeegee it is time to wipe any remaining solution from around the edges of the glass using a 100% cotton towel once again. Finally we will wipe down all your sills. Once done on both the inside and outside of the window we will replace the clean screen and the window is 100% done! We will finish our process by walking around your home and making sure all windows are 100% clean, at this time we will place furniture back into their original location leaving your home just as we found it….but only better with clean windows!!! We take our job very serious and are very proud of a job done well done. We are so proud of our work we offer a satisfaction guaranteed to all of our customers. Any imperfection in our cleaning process will be dealt with immediately by a member of our team. Not only do we offer a superior window cleaning process, we are also fully insured so you don’t have to worry when we are on the job. If you’re looking for the cheapest price window service we are probably not for you. Although our prices are very competitive our level of service is much beyond what some other window washers provide at a cheaper price. Like most things in this world you get what you pay for The nice thing with A Perfect View Inc. you are getting a superior clean at a very competitive price. Our schedule stays pretty full, so if you know you need clean windows by certain date please allow time and book early so we can ensure those dates. We are very passionate about our work and pride ourselves on details. Because of this we offer a Satisfaction Guarantee on all of our jobs, if there is something that is not done quite right we will be more than happy to come right back out and correct the problem right away. This includes our gutter cleaning and pressure washing services. Check out our facebook link by clicking here. For a free estimate in writing, please call us at 612-723-7155 or send us a email. Thank you for your consideration.